Happy 5th Anniversary LAFPI Blog! Today is the 5th Anniversary for the LA FPI Blog. My excitement over the diverse voices that frequent this blog never wanes. Pick a few bloggers and read their articles. Tell me what you think. 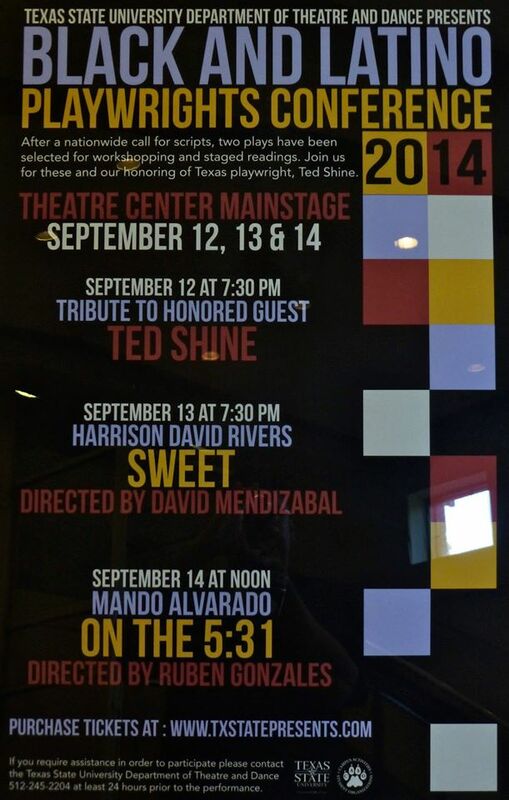 The Texas State Black and Latino Playwrights Conference is in its 12th year. Eugene Lee is the Artistic Director for the conference. Mr. Lee is an established actor, director and writer. I have admired his work as an actor for years. A fellow LA FPIer, Laura Shamas, told me about this conference and although my play did not get in that year, 2012, it was a finalist which warranted a call from Mr. Lee. To have someone actually get your story and be able to pick it apart and see things you didn’t know you wrote into the piece was wonderful. I went to the conference this year because I was needing to be in the room with other artists at work. I really wanted to see the process. I am so thankful that I went. I learned a lot, made some friends and shook whatever that thing was that was on me keeping me from my computer. I am hoping this conference stays around for a very long time, its a great place to get things done. The Black and Latino Playwrights Conference was established to fill a void where the voices of Black and Latino playwrights can be heard, nurtured and celebrated. The plays can be about whatever the playwright deems stage worthy; it’s the voice of that playwright this is most important to this conference. It’s a place where student artists can become familiar with the other voices that make up American Theater. In this vein, the most rewarding part of the conference is to hear those diverse voices, to see those playwrights at work at their craft, and to watch the students jump in fully committed to the scripts. Eugene Lee has a vision for the Black and Latino Playwrights Conference that can change the way minorities are viewed in Theater; his generous nurturing of the artists is greatly appreciated. And too, the generosity and foresight of Texas State University at San Marcos to seek out Mr. Lee to start such a conference is awesome. Thank you, Texas State! Thank you, Eugene Lee! Every culture, in this multicultural place we call America, deserves a seat at the table. It’s places like San Marcos and this conference that can… that make room and give sustenance to playwrights kicking against the pricks…. Associate Artistic Directors for the conference are Joe Luis Cedillo and Nadine Mozon. Production Manager for the conference is Shannon Richey (AEA). by Laura Shamas can be read on the HOLLYWOOD JOURNAL website under the “Industry Impressions” section. I found Laura’s article to be well written, informative and to be honest comforting. We, artists, have our ways of being that make us who we are and who we are is what sets the pitch and frequency of our voices and the stories we tell… Please go here to read it. The LAFPI Blog Celebrates 4-Year Anniversary! Happy Anniversary to the LA FPI Person of Interest Blog! Today we celebrate four years of blogging. I have enjoyed our diverse group of voices. I have enjoyed the moments when after reading these ladies or watching a video or film, I break out into laughter or tears – those moments when I am found…. There is nothing like being in a funk and have someone write “Oink! Oink!” or having to leave my desk to shake myself after reading “When Playwrights Get Old” which came about after “Too old?” left me numb and very contemplative. When I look in the mirror, I see me and have to remind myself that the first set of students at the university where I work my day job have graduated and are in their thirties now. The few that have stayed on in employment shock me when I run into them yet when I look in the mirror I don’t see age — I see me. One wonders if after all the “Taking Stock” we do if a change is gonna come – ever – but we keep hoping and pushing and fighting for that “Stillness” that drives us. How much more drive does it take for a woman to succeed than a man? Can it even be measured? Who cares? Trying to keep myself moving. No time to research how a man does it unless it helps me. Writers are always “On a new path…” to stay motivated and to be able to encourage oneself to do one’s art which is supposed to lead to “When you hear your words in someone else’s mouth…” You hope. One hopes. The goal is to be a working artist. By that I mean, you don’t have to have a day job to pay the rent, pay for submission fees, or afford you food while you write. Living in near poverty to be an artist should be against the law especially because that same art could end up being a national treasure; the following terms are not interchangeable: “Working Artist – Donating Artist – Surviving Artist“. There should be no limitations or rules on where or in what form a writer creates story as there are no rules to who can be “The Happiest Person in America” or one of the happiest people – let us do our art and we are there… Gender does not dictate what shared work will change the world in some way — “And The Female Play at the Tonys was…” and it should not dictate who has access to the stage, the screen or the bookshelf. Great stories all start the say way — with words and the “Voice…” of the writer. All are needed, each soprano, alto, tenor and bass… There should not have to be “The Bechdel Test for the Stage“; there should not have to be a Bechdel test at all – why can’t all stories worth telling be treated equal? Why can’t the journey be easier? Why can’t handling “Our Expectations, Our Fears” as artists be easier? Perhaps even this tug-of-war on gender parity fits into the “Everything Is A Creative Act” category; it is, after all, fodder. I especially like what Pulitzer Prize Finalist playwright Lisa Kron said at the last Dramatists Guild Conference “Having Our Say: Our History, Our Future” about what she does when something rubs her the wrong way “I’m going to write a play about this” — The Veri**on Play is what resulted. Just wondering, do you have any favorite LA FPI blog articles? Jessica Abrams, Tiffany Antone, Erica Bennett, Nancy Beverly, Andie Bottrell, Robin Byrd, Kitty Felde, Diane Grant, Jen Huszcza, Sara Israel, Cindy Marie Jenkins, Sue May, Analyn Revilla, Cynthia Wands and special input by Laura Shamas and Jennie Webb. Happy Anniversary: LAFPI Turns Four! 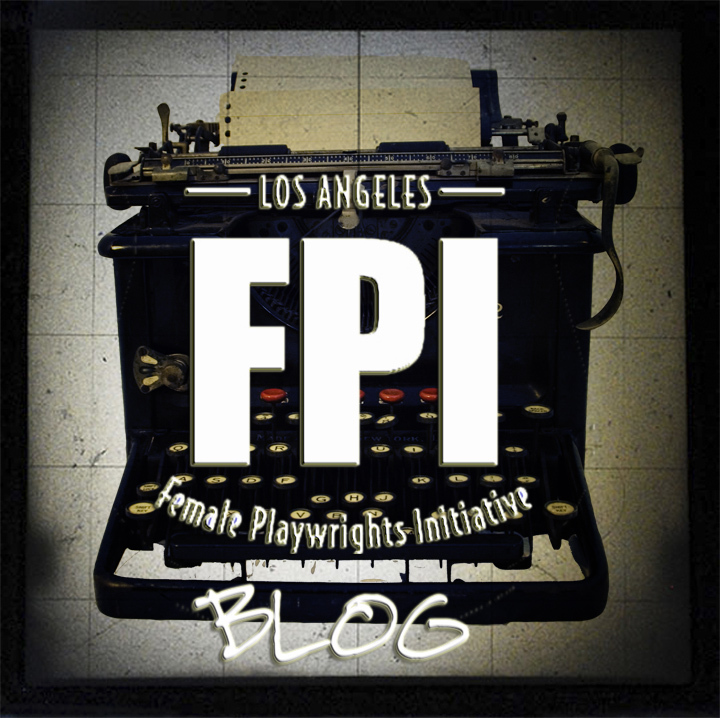 LA FPI started with the Study to see what the figures were in gender parity in theater in Los Angeles, we still find ourselves taking Stock and looking at/for changes regardless of the size. We continue to celebrate women on stage, we question theaters with seasons void of the female voice, and always look at the numbers problem and why it matters to us and should matter to everyone else. What if theatre weren’t seen as a luxury but as central to the fabric of our country? The Theatre Communications Conference is asking this question and more from June the 16th through the 18th at the Dorothy Chandler Pavilion, the Biltmore; and the Central L.A. High School #9, for the Visual and Performing Arts. LAStageAlliance is sponsoring the conference, which is also celebrating the fiftieth anniversary of TCG. The national organization for the American theatre, their website says, was founded in 1961 with a grant from the Ford Foundation to foster communication among professional, community and university theatres, and now has nearly 700 member theatres and affiliate organizations and more than 12,000 individuals nationwide. There are 1,084 attendees signed up – playwrights, artists and members of theatres from all over the country – and the TCG has teamed with Radar L.A which will be presenting its plays at the same time, including Moving Arts’ Car Plays, L.A., and a CalArts’ adaptation of Gertrude Stein’s play, Brewsie and Willie. What if artists and other theatre leaders talked regularly and openly about art and aesthetics? What if theatre institutions and their boards committed to hiring more people of color in leadership positions? What if a group of billionaires created a “Giving Pledge” initiative for theatre? What if the US became more embedded in wars around the globe – what would become the role of theatre and artists? What if there were a new audience engagement model as powerful as the subscription model? What if theatres and artists could commit to each other for multiple years? What if we could solidify new business models that would truly lead to the sustainability of our theatres? Here’s one I wish it was asking. What if more artistic directors were committed to producing plays by women? However, women and the LAFPI are represented. Hooray! Instigator Laura Shamas, and Paula Cizmar are asking “What if…Social Activism Could Inspire New Models of Theatre?” on Thursday, June 16th at the Biltmore Hotel from 2:30 to 4:00, and instigator Dee Jae Cox is moderating a panel called “What if Women Ruled The World?” on Saturday, June 18th at the Central L.A. High School from 11 to 12:30. I know that one rarely makes contacts at any conference that lead on to fame and fortune. (I went to one a while back that was called Reinventing the Future. I’m still reinventing and thank God the future is always a day away.) 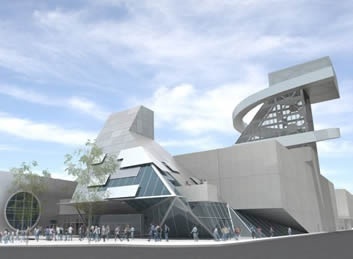 But the panels sound interesting and may lead to some positive changes, and the explosion of the L.A. Theatre surrounding the conference is exciting. I imagine that a great schmoozefest will be the heart of the affair. And that sounds like fun. With one thousand and eighty four people there, everyone is bound to meet a few simpatico persons, exchange some good ideas, and have a few laughs.